While washing clothing in warm to hot water will eliminate most microbes, it won’t kill all germs. That is because a washing machine actually just recycles and redistributes existing bacteria and fungus like mold across you entire load, eventually rinsing this water out. During this process most germs will in fact be eliminated, just know that to truly kill all bacteria and fungus you’ll have to use chlorine bleach. While chlorine bleach works extremely well eliminating mold and other microbes from dirty laundry, household bleach is not as effective. Yes, bleach will eliminate mold and its spores on many non-porous surfaces, including glass, tile and countertops. However, bleach products cannot completely eliminate mold growing in and on non-porous surfaces such as wood and drywall. Additionally, bleach contains chemicals and is harmful to humans and the environment. Even if you wash your clothes in hot water with chlorine bleach, mold can still grow. Mold spores are present everywhere but need a moist, damp environment to grow and multiply. 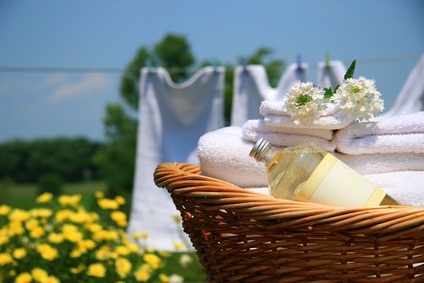 Not drying your clothes right away or to completion can create such an environment and lead to unwanted mold growth. If you accidentally leave your clothes in the washer and come back to a musty smell, re-wash your clothes with chlorine bleach. Mold and mildew infestation are extremely serious and should be addressed accordingly. If you find that you have visible mold or smell a foul, musty smell, give 911 Restoration a call and let our mold remediation specialists take care of you and give you a fresh start in your home!